Enrollment is now CLOSED – Thank you to everyone who got in this time! What would it be worth to teach only the English that YOU want to teach? To have only the students and parents that love what you do. And have them paying the value you are truly worth? The whole course is run on Facebook with each week featuring a 60 minute pre-recorded video with the core skills you need to take your school to the next level. You can watch as each one is sent out, or review it later if your schedule is a little hectic! Plus I’ll be in the Facebook group every week to answer your questions and get you up and running. Module 1: Business Basics: How to start your school and the techniques & mindset I used to go from 1 student to now millions. The foundations and outlook you need. Plus learn the mistakes I made and how you can avoid them. Module 2: The “10k Pricing Plan” No more guessing on how much to charge. With the “10k Pricing Plan” you’ll take away all the stress and know *exactly* what to set your prices at. This is worth the whole price of the program for many people. Module 3: Marketing tips from the top schools: Standing outside with fliers isn’t going to work anymore. I’ll show you the top marketing ideas, many of them zero or low-cost that the best schools from around the world are using to get 100s of new students right now. Module 4: The best school starts with the best you: It sounds all “hippy” and “woo woo” but taking care of yourself is the best way to take care of your business. I walk you through the strategies, mindsets and morning routines that some of the most successful school owners use. If you want a stress free life, this is where you start! Module 5: How to hire AMAZING staff! It’s not about just hiring a “teacher,” I’ll show you how to hire a team of SUPERHEROES who will take your school and your vision to the next level. This advanced module is hard work and the benefits are enormous. Module 6: Accountability: It’s all very well learning all these latest techniques, the overachievers take it and practice it everyday. In the course you will have an amazing community of school owners to keep you on track, to ask questions and we also have a archive of one-on-one video consulting sessions with school owners just like yourself so you can see their struggles, achievements and learn their strategies. Bonus Module: Online marketing and Online Teaching: Want to teach and live on the beach? Or get new students whilst you sleep? This module is for you. I’ll show you the techniques and strategies that are working right now, and that I have personally paid 10s of thousands of dollars to learn, so you can market online and, if you wish, start teaching online. 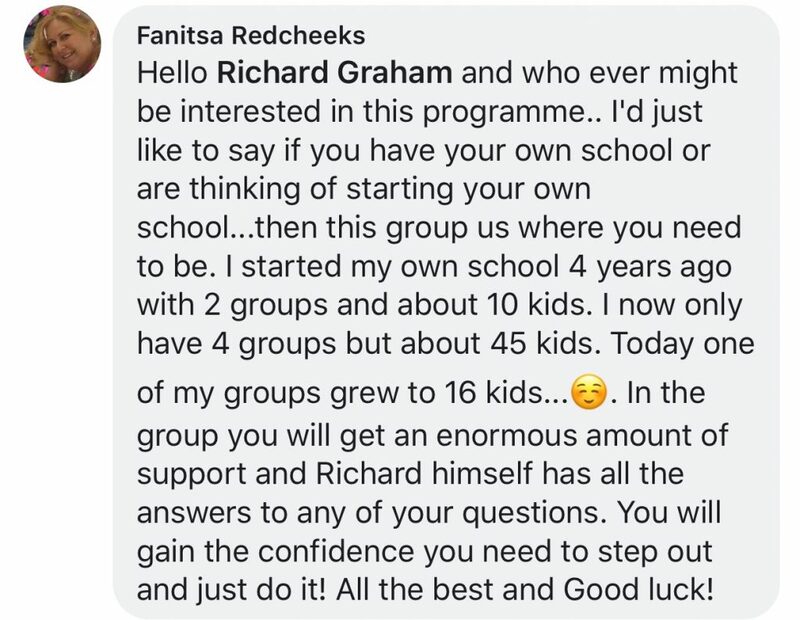 Each month we take one member of the course and have a 30 minute group “hot seat” where you can ask me questions and see how other school owners throughout the world are coping with, and oftentimes thriving, with the same issues you have in your school. It’s a huge confidence boost! 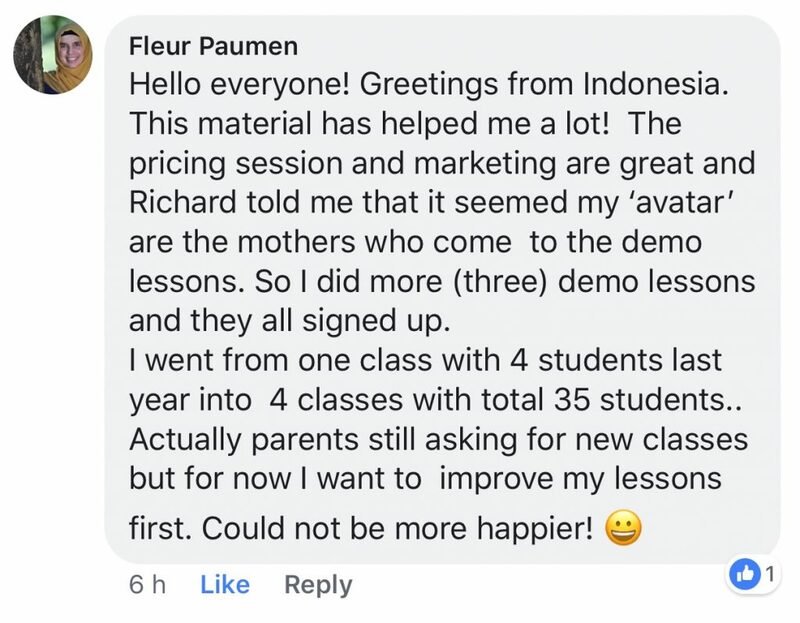 I don’t know of any other video course out there specifically designed for school owners or teachers who want to start their own business and I’m so thrilled with how the results turned out last year that I’m going to fully guarantee it this time. If you don’t find it super awesome for your school, just send me an email within 30 days and I’ll give you your money back.